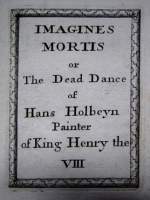 Imagines Mortis or the Dead Dance of Hans Holbeyn, Painter of King Henry the VIII. All that e'er had Breath / Must Dance after Death. 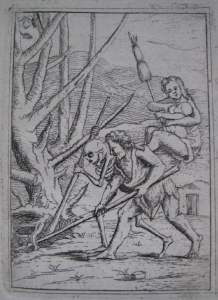 Death's Dance, 1720, sold by J. Clark in Grays Inn. Senere er trykkene solgt separat, hvor det første af dem har fået tilføjet over- og undertekst (billedet til højre). Billedet af rådsherren mangler den lille djævel; på billedet af bissekræmmeren mangler den ene dødning. Billederne er kopier af Holbein og ikke — som man kunne tro — af Hollar. Det kan se dels ved, at Døden angriber soldaten med en knogle istedet for en pil, og dels ved at de 19 tryk inkluderer fire scener, som Hollar ikke har: benhus, advokat, nar og blind. Trykkene er med Francis Douces ord: »nineteen very indifferent etchings«, meget middelmådige kobbertryk. Den eneste grund til, at de er værd at nævne, er den vægt Douce gav bogens forord, og den omfattende diskussion, den har forårsaget, og som jeg vil forsøge at opsummere. I det håndskrevne forord — som er forskelligt for hvert eksemplar — hævder forfatteren tilsyneladende, at Holbein havde malet dødedansen på væggene af Henry VIII's palads i Whitehall, der brændte ned i 1698. But it has entirely escaped the knowledge of all the biographers of Holbein, that he painted a Dance of Death in fresco, upon the walls of the palace of Whitehall, which was consumed by fire in 1697. 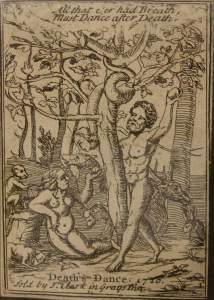 (2) This curious fact is ascertained from two sets of nineteen very indifferent etchings from the wooden cuts, by one Nieuhoff; they were never published, but copies of them presented to the artist's friends, with manuscript dedications in the Dutch language, in which he speaks of the abovementioned paintings at Whitehall. 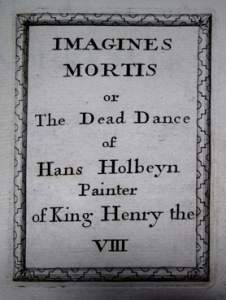 The book has the following title engraved in a border: "Imagines Mortis, or the Dead Dance of Hans Holbeyn, Painter of King Henry the VIIIth." The author, in one of these dedications, addressed to the Right Honourable William Benting, informs him, that "he had met with the scarce little work of H. Holbeyn in wood, which he had himself painted as large as life in fresco, on the walls of Whitehall; that he had followed the original as nearly as possible, and had presumed to lay his copy before him as being born in the same palace; that he considered the partiality which every one has for the place of his nativity, and that therefore an account of what was curious and remarkable therein, and of what was then no more, as being destroyed by a fatal fire, must of course prove acceptable, particularly as there were hardly any more remains of the palace left than his own dwelling." He then states, that the design of the painter resembled that of the founder of the Greek monarchy, who ordered these words to be written to remind him of his mortality: "Remember, Philip, that thou art a man!" and proceeds to describe in a very quaint manner the different subjects of his work. The dedication to the other copy is nearly in similar words, and addressed to Mynheer Heymans, who appears, in consideration of his singular merits, to have had a dwelling assigned him in the palace at Whitehall. From the hand-writing and Dutch names in this work, it is evidently of the time of William III but of the artist no memorial is preserved; however, the importance of the fact which he has recorded, will render him a valuable personage in the opinion of the lovers of the arts. After what has been said then, it is to be hoped that no additional evidence will be requisite to shew that Holbein did not invent the subjects, nor execute the cuts belonging to the Dance of Death, which is usually ascribed to him; that he painted it, however, and most assuredly more than once, seems to be beyond the possibility of doubt. 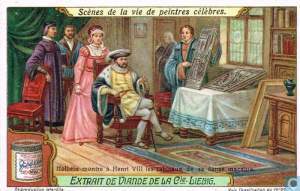 Holbein præsenterer sin dødedans for Henry VIII. Douce har altså set to eksemplarer af denne bog, i hvilken Nieuhoff fortæller, at Holbein havde malet dødedansen i naturlig størrelse på væggene i Whitehall. Denne bog er sidste punkt i bevisførelsen for Douce's yndlingsteori, nemlig at Holbein ikke er ophavsmanden til de berømte træsnit: »it is to be hoped that no additional evidence will be requisite to shew that Holbein did not invent the subjects, nor execute the cuts belonging to the Dance of Death, which is usually ascribed to him«. 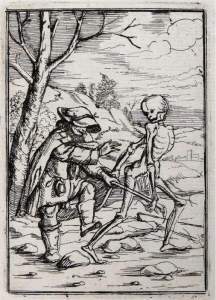 Hier darf auch ein vermeintlicher Beitrag zu Holbeins Kunstgeschichte, der sich in dem mehrmals erwähnten kleinen Werke: the dance of death, painted by Holbein, engraved by Hollar, findet, nicht übergangen werden. Der Herausgeber bemerkt: »es sey allen Biographen Holbeins entgangen, daß er einen Todtentanz in Fresco in dem Pallaste zu Whitehall, der 1697(2) vom Feuer verzehrt worden, gemahlt habe. - Das wäre allerdings eine bedeutende Entdeckung, wenn man ihr einigen Glauben beimessen könnte. Allein weder van Mander, noch Sandrart, noch Patin, die alle in England gewesen, und Whitehall noch gesehen haben, melden ein Wort von diesem gemalten Todtentanz, auch Vertue nicht, und Niemand, als dieser unbedeutende und unbekannte holländische Kupferstecher Neuhof, und blos in handschriftlicher Mittheilung. - Es wäre auch hier dieser Fabel keine Meldung geschehen, hätte nicht Douce ein unverdientes Gewicht darauf gelegt, und fänden seine oberflächlichen Kunstforschungen nicht unverdienten Glauben bei Englischen und andern Compilatoren. Diese Warnung vor unbegründeten Nachrichten möge für hundert Andre gehen; denn es würde ein eignes Buch erfordert, alles Halbwahre und Falsche und Irreleitende, was über den Todtentanz, und seinen Urheber überhaupt, geschrieben worden, anzuführen und zu widerlegen. Hegner kalder historien en "Fabel", som han kun nævner pga. den ufortjente vægt, Douce har tilskrevet den, og den ufortjente tiltro, som Douce's overfladiske kunstforskning havde blandt engelske og andre samlere. Hegner bruger historien til en generel advarsel mod grundløse oplysninger. Det ville kræve en selvstændig bog at beskrive alt det halvsande, forkerte og vildledende, der er skrevet om dødedanse. "Sir, — The costly palace of Whitehall, erected by Cardinal Wolsey, and the residence of King Henry VIII. contains, among other performances of art, a Dance of Death, painted by Holbein in its galleries, which, through an unfortunate conflagration, has been reduced to ashes; and even the little work which he has engraved with his own hand, and which I have copied as near as possible, is so scarce, that it is known only to a few lovers of art. And since the court has thought proper, in consideration of your singular deserts, to cause a dwelling to be built for you at Whitehall, I imagined it would not be disagreeable to you to be made acquainted with the former decorations of that palace. It will not appear strange that the artist should have chosen the above subject for ornamenting the royal walls, if we consider that the founder of the Greek monarchy directed that he should be daily reminded of the admonition, 'Remember, Philip, that thou art a man.' In like manner did Holbein with his pencil give tongues to these walls to impress not only the king and his court, but every one who viewed them with the same reflection." He then proceeds to describe each of the subjects, and concludes with some moral observations. "The high, noble, and wellborn Lord William Benting, Lord of Rhoon, Pendreght, &c."
"Sir, — In the course of my constant love and pursuit of works of art, it has been my good fortune to meet with that scarce little work of Hans Holbein neatly engraved on wood, and which he himself had painted as large as life in fresco on the walls of Whitehall. In the copy which I presume to lay before you, as being born in the same palace, I have followed the original as nearly as possible, and considering the partiality which every one has for the place of his birth, a description of what is remarkable and curious therein and now no longer existing on account of its destruction by a fatal fire, must needs prove acceptable, as no other remains whatever have been left of that once so famous court of King Henry VIII. built by Cardinal Wolsey, than your own dwelling." He then repeats the story of Philip of Macedon, and the account of the subjects of his etchings. At the end of this dedication there is a fragment of another, the beginning of which is lost. The following passages only in it are worthy of notice. "The residence of King William." "I flatter myself with a familiar acquaintance with Death, since I have already lived long enough to seem to be buried alive, &c." In other respects, the same, in substance, as the preceding. Nu har Nieuhoff fået endnu et navn: Piccard, og Douce har nu set tre eksemplarer af bogen. Han beskriver dog stadig kun to af dem. Her i 1833 citerer Douce, hvad Nieuhoff rent faktisk har skrevet, og som man kan se, hævder Nieuhoff ikke, at han har kopieret dansen fra væggene i Whitehall. Tværtimod siger han — mere eller mindre — at han blot har kopieret en trykt udgave af Holbein's træsnit: »the little work which he has engraved with his own hand, and which I have copied as near as possible«. Douce var selv nået til en lignende erkendelse: »For his greater convenience, he appears to have preferred using the wood engravings instead of the paintings«. De 19 graveringer kan altså ikke bruges som vidne. Den eneste oplysning om det påståede maleri er, hvad Nieuhoff skriver i forordet, og ingen ved, hvem han var, hvornår han levede, eller om han selv skulle have set maleriet. I slutningen af bogen (side 240 og frem) fortæller Douce, at han for nyligt har læst Hegner's bog, og han er ikke glad. Douce refererer til Hegner som "the above gentleman" med "gentleman" i kursiv; Douce bruger flere sider på at gennemhegle Hegner's bog, der er »greatly abounding in error and false conceit«, mens Hegner selv er: »wholly unqualified, and with much unseemly arrogance, and its usual concomitant, ignorance«. Midt i sin fem siders bredside mod Hegner kommer Douce med en slags indrømmelse: »The identification of William Benting must be left to the sagacity of others«. Benting var den mand, Nieuhoff havde dedikeret en af bøgerne til, og Douce kunne forventes at have undersøgt bogens proveniens — d.v.s. spørge den nuværende ejer om, hvem der tidligere havde ejet den, og hvor den kom fra. Mr. Douce next proceeds in his search after the "painting," and he is not long in finding what he wishes for. According to his statement, "very soon after the calamitous fire at Whitehall, 1697, which consumed nearly the whole of that palace, a person, calling himself T. Nieuhoff Piccard, probably belonging to the household of William III, and a man who appears to have been an amateur artist," made etchings after nineteen of the cuts in the Lyons Dance of Death. Impressions of those etchings, accompanied with manuscript dedications, appear to have been presented by this T. Nieuhoff Piccard to his friends or patrons, and among others to a Mynheer Heymans, and to "the high, noble, and well-born Lord William Denting, Lord of Rhoon, Pendraght," &c. The address to Mynheer Heymans contains the following important piece of information respecting a work of Holbein's, which appears most singularly to have escaped the notice of every other writer, whether English or foreign. "Sir, — The costly palace of Whitehall, erected by Cardinal Wolsey, and the residence of King Henry VIII, contains, among other performances of art, a Dance of Death, painted by Holbein, in its galleries, which, through an unfortunate conflagration, has been reduced to ashes." In the dedication to the "high, noble, and well-born Lord William Benting," the information respecting this curious work of art, — all memory of which would have perished had it not been for the said T. Nieuhoff Piccard, — is rather more precise. "Sir, [not My Lord,] — In the course of my constant love and pursuit of works of art, it has been my good fortune to meet with that scarce little work of Hans Holbein, neatly engraved on wood, and which he himself had painted as large as life, in fresco, on the walls of Whitehall." Who Mynheer Heymans was will probably never be discovered, but he seems to have been a person of some consequence in his day, though unfortunately never mentioned in any history or memoirs of the period, for it appears that the court thought proper, in consideration of his singular deserts, to cause a dwelling to be built for him at Whitehall. My Lord William Benting, — though from his name and titles he might be mistaken for a member of the Bentinck family, — appears to have been actually born in the palace. It is, however, very unfortunate that his name does not occur in the peerage of that time; and as neither Rhoon nor Pendraght are to be found in Flanders or Holland, it is not unlikely that these may be the names of two of his lordship's castles in Spain. With respect to T. Nieuhoff Piccard, whose manuscript addresses to "Mynheer Heymans" and "Lord William Benting" are cited to prove that Bourbon's verses must relate to a painting of the Dance of Death by Holbein in the old palace of Whitehall, nothing whatever is known; and there is not the slightest reason to believe that a Lord William Benting, born in the old palace of Whitehall, "Lord of Rhoon, Pendraght," &c. ever existed. I am of opinion that the addresses of the person calling himself T. Nieuhoff Piccard are a clumsy attempt at imposition. Though Mr. Douce had seen both those addresses, and also another of the same kind, he does not appear to have made any attempt to trace their former owners, nor does he mention the names of the parties in whose possession they were at the time that he saw them. He had seen the address to "Lord William Benting" previous to the publication of his observations on the Dance of Death in 1794, when, if he had felt inclined, he might have ascertained from whom the then possessor had received it, and thus obtained a clue to guide him in his inquiries respecting the personal identity of the Lord of Rhoon and Pendraght. But this would not have suited his purpose; for he seems to have been conscious that any inquiry respecting such a person would only have tended to confirm the doubts respecting the paper addressed to him by Piccard. It is also uncertain at what time those pretended addresses were written, but there are impressions of the etchings which accompanied them with the date 1720; and I am inclined to think that if the paper and handwriting were closely examined, it would be found that those pretended presentation addresses were manufactured about the same, or perhaps at a later period. Whoever the person calling himself T. Nieuhoff Piccard may have been, or at whatever time the addresses to Mynheer Heymans and others may have been written, the only evidence of there having been a painting of the Dance by Holbein at Whitehall rests on his unsupported statement. Such a painting is not mentioned by any foreign traveller who had visited this country, nor is it noticed by any English writer prior to 1697; it is not alluded to in any tragedy, comedy, farce, or masque, in which we might expect that such a painting would have been incidentally mentioned had it ever existed. Evelyn, who must have frequently been in the old palace of Whitehall, says not a word of such a painting, though he mentions the Lyons Dance of Death under the title of Mortis Imago, and ascribes the cuts to Holbein; and not the slightest notice of it is to be found in Vertue or Walpole. Chatto lægger ikke fingrene imellem. Han mener ikke Benting (ejeren af den ene bog), nogensinde har eksisteret: »and there is not the slightest reason to believe that a Lord William Benting, born in the old palace of Whitehall, "Lord of Rhoon, Pendraght," &c. ever existed«, og det samme gælder hans to landsbyer: »neither Rhoon nor Pendraght are to be found in Flanders or Holland«. I indekset bliver Benting sågar kaldet en "opdigtet figur": »Benting, William, Lord of Rhoon and Pendraght, a fictitious character, mentioned by T. Nieuhoff Piccard«. Chatto mener, forordene er et klodset forsøg på svindel: »I am of opinion that the addresses of the person calling himself T. Nieuhoff Piccard are a clumsy attempt at imposition«, og Douce bliver kritiseret for sin blinde tillid til en mand, der måske slet ikke eksisterer: »he believes, on the sole authority of one T. Nieuhoff Piccard, whose existence is as doubtful as Macaber's, that Holbein painted a Dance of Death as large as life, in fresco, in the old palace at Whitehall« (side 406). oget af diskussionen kan let afklares. Det er muligt, at hverken Douce eller Chatto var i stand til at identificere den William Benting, der var født på Whitehall, men i vore dage tager det ikke mange splitsekunder for Google at finde Willem Count Bentinck, født i Whitehall i London, 1704, død i 1774, Lord of Rhoon and Pendrecht. Og bogen eksisterer skam, for et eksemplar blev sat til salg på Internettet i marts 2012. I dette eksemplar har en tidligere ejer skrevet et uddrag af Douce's artikel fra 1794: »It has entirely escaped the knowledge of all the biographers of Holbien [sic] that he painted a Dance of Death in fresco upon the walls of the palace of Whitehall which was consumed by fire in 1697. This curious fact is ascertained from 2 sets of nineteen etchings from the wooden cuts by one Nieuhoff«. Ejeren har dog let og elefant sprunget to ord over, for Douce havde skrevet »nineteen very indifferent etchings«. Ejeren fortæller yderligere, at dette eksemplar er dedikeret til »Mynheer Kousemaker, a man of great wealth who came over with King William the 3(rd), and settled in Surrey«. Når alt dette er sagt, har Chatto stadig ret i meget af sin kritik. Det burde have været et small sag for Douce at opsnuse William Benting ved simpelthen at spørge bogens ejer om, hvor han havde bogen fra. Samtidig svækker identifikationen af William Benting Douce's sag: Det er rigtigt, at Benting blev født i Whitehall, men det var først i 1704, seks år efter at det meste af paladset var brændt ned. Benting havde altså aldrig set det omtalte maleri. Både Chatto og Hegner pointerer også, at masser af kunstkendere havde besøgt paladset: Mander, Sandrart, Patin og Vertue, og ingen af dem har set et sådant maleri. Til sammenligning var maleriet i Basel 60 meter langt og altså svært at overse. Til sidst skal det (igen) huskes, at når Douce så forbitret forsvarer denne beskrivelse af maleriet i Whitehall, skyldes det især, at han mener det er med til at bevise, at Holbein ikke har designet de berømte træsnit: »it is to be hoped that no additional evidence will be requisite to shew that Holbein did not invent the subjects, nor execute the cuts belonging to the Dance of Death, which is usually ascribed to him«. Douce's logik er formentlig, at hvis man kan bevise, at Holbein havde malet en dødedans i Whitehall, så kan det forklare meget af den ros, samtiden gav ham. Denne ros ville så ikke skyldes de berømte træsnit, men maleriet i Whitehall. Her må det siges, at kæden hopper af for Douce. Han erkender selv, at Nieuhoff har kopieret en af de trykte udgaver af Imagines Mortis, og det har Nieuhoff naturligvis gjort, fordi han vidste (eller gættede på), at de to dødedanse så ens ud. Hvis Douce's eneste vidne, Nieuhoff, vitterligt havde set det påståede maleri, ville det bare være yderligere et bevis for, at Holbein havde designet træsnittene. Men faktisk skriver Nieuhoff ingen steder, at han selv har set det: »It has been my good fortune to meet with that scarce little work of Hans Holbein neatly engraved on wood, and which he himself had painted as large as life in fresco on the walls of Whitehall«. Nieuhoff har set Holbein's træsnit: »neatly engraved on wood«, og han ved/tror, at Holbein også havde malet en sådan dans i Whitehall. Men han skriver ikke, at han har set det. Nieuhoff var ikke i tvivl om, at Holbein var ophavsmanden til Imagines Mortis: »a Dance of Death, painted by Holbein in its galleries, […] and even the little work which he has engraved with his own hand, and which I have copied as near as possible« og »that scarce little work of Hans Holbein neatly engraved on wood«. Der har været en del hollændere ved den engelske hof i den periode. Kong William III af England (1650 - 1702) var født i Holland. Under navnet Willem III var han fyrste af Oranien, indtil han blev engelsk konge i 1689 (det er et tilfælde, at han var den tredje Willem/William i både Oranien og England). 1697 . . .: Branden skete 4 januar 1698. England først gik over til den gregorianske kalender i 1752. Mellem 1155 og 1751 startede det nye år 25 marts.